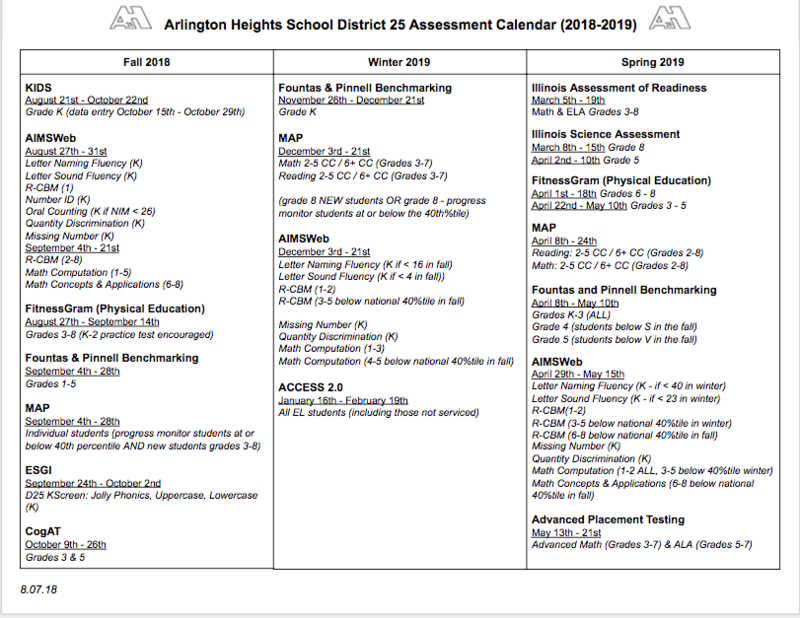 District 25 uses Measures of Academic Progress for students in grades 2-8. Measures of Academic Progress (MAP) are computerized adaptive tests that measure your student's general knowledge in reading, language usage, and mathematics. Your student will take MAP beginning in second grade and again every year through grade 8. To learn more about these tests, click the Measures of Academic Progress link . Students in District 25 take the Illinois Standards Achievement Test as required by Illinois law. ISAT results are reported in School Report Cards. To learn about ISAT/School Report Cards, click on the ISAT link. District 25 uses an assessment called AIMSweb to help identify students who are having difficulty with phonemic awareness, fluency, comprehension and other important reading skills as well as math concepts and functions. To learn more about AIMSweb, click the link. For your convenience, we have included a short glossary of some testing vocabulary, which you may wish to use as a reference.